Summersands 39 - Durban Beachfront Accommodation. via the booking enquiry form on this website. Summersands 39 is situated in the prime area of the Durban Beachfront, it is a 2 bedroom 2 bathroom, luxury self-catering apartment. It has modern furnishings and decorated with beautiful paintings and chandeliers. The bedrooms are carpeted and has bedside lamps, co-ordinated decor with valences. There is a king bed (can be converted to 2 singles) in main bedroom and a double bed in 2nd bedroom. It also has a sleeper couch in the lounge, so it can sleep 4 individual persons or 6 people sharing 4 in the bedrooms and 2 persons on the sleeper couch in the lounge. High quality linen is provided with topsheet / undersheet & quilt or 100% cotton duvets. Good supply of pillows and cushions with spare thick blankets available. The lounge is equipped with a colour TV, DVD player, DSTV (satellite TV-bouquet) with over 30 channels incl. cartoon network for the kids. There is an open balcony with a side sea-view of the ocean and is great for having breakfasts or just relaxing and watching the world go by. The kitchen has all utensils for cooking, pots/pans, cutlery/crockery, toaster, kettle,. Has a microwave, fridge, 4 plate stove/oven & extractor fan. The main bathroom has a toilet, sink bathtub (with shower facilities) and the en-suite a toilet, sink and shower only. The Main bedroom & lounge fitted with aircon whilst both bedrooms have ceiling fans. The Complex has an attractive appearance with maintained gardens and a beautiful pool / entertainment area, perfect for your braais (with built-in braai). 24 hour secure parking on premises (optional) and off-road parking available. Stairs to unit. 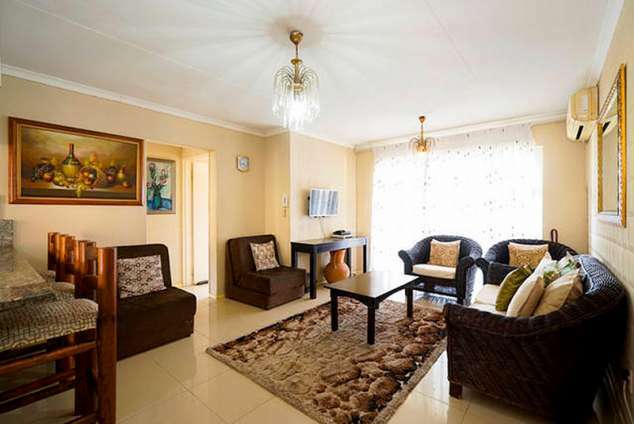 The apartment is very central and conveniently located A mere 2 min walk to the swimming beach, Suncoast Casino & Entertainment world (with movies theatres, take-aways KFC, Nandos, Spur, Wimpy and sit down restaurants, Fleamarkets, Ice-rink, Mosque, Movies, Restaurants, Supermarkets, Durbans Marine Parade. Less 1km to the ICC (International Convention Centre) & Durban Exhibition centre. Near Ushaka Marine World, Moses Mahbida Soccer Staduim, Mr Price Stadium (ABSA - Kingspark), Kingspark Swimmingpool, Kingsmead / Sahara Stadium, Blue Lagoon, Durban Bus / Train Station, Greyville Racecourse, Wilsons Wharf & Durban Harbour. Wide range of brochures/leaflets about local and surrounding areas available with information about local golf clubs, fishing, riding, bicycle hire, and sporting/leisure activity. Should you come via plane, train or bus (transfers also available), a car is not essential as it is an excellent location, you can walk to supermarkets (Pick n Pay & Spar, Pharmacy, liqour store & laundry facilities, DVD / Video Rental), movies, restaurants and entertainment. A quick ride on the people mover bus (at R4 ticket) will take you to Ushaka Marine World (20min walk), Suncoast Casino, South Beach (Funfair) , Victoria Street Market (great for buying gifts), Playhouse (live theatre), City Hall which has a library & Natural Science Museum is a must to see and its entry is free. It is also only 10 min drive to the largest shopping centre Gateway Theatre of Shopping or Pavillion Shopping Centre. Great destination, Convenient location, safe area, Definite value for money and our guests love staying here when in Durban. From N3 into Durban, down Old Fort Road towards ocean, left turn on Playfair, drive past (back of Holiday Inn North Beach & Elangeni) across robots 50m turn left into Sandown and immediate right into Sol Harris. and to boom / security gate at the end of the road. YOU ARE THERE! 316888 page views since 23 Nov, 2006.